This entry was posted in Issue 3, Michael Dransfield, Michael Dransfield’s Lives, Patricia Dobrez, Robert Adamson and tagged A.D Hope, Adelaide Writers Week, Australian Book Review, Carl Harrison-Ford, Courland Penders, Drug Poems, Geoffrey Dutton, Gregory Corso, Hart Crane, Jacques Prevert, John Kinsella, literature, Martin Johnston, Memoirs of a Velvet Urinal, Michael Dransfield, Michael Dransfield: A Retrospective, New American Poetry, New Poetry, Poetry Magazine, Robert Adamson, Sidney Noland, Streets of the Long Voyage, Terry Sturm by Mark Roberts. Bookmark the permalink. It became important at the beginning of the seventies to live the life of a poet. Shelton Lea did just this – also with the drugs and even more alcohol but perhaps without as much genius as Dransfield – by with at least as much ‘imagineering’ and romanticism – his poem ‘Maggie’ who died in his arms one night in the ‘Gardens of Babylon’ (On the corner of Gertrude St and Brunswick St Fitzroy – outside the high rise flats – four gum trees) is as beautiful as is his Nebechanezza poems published the week before he died. 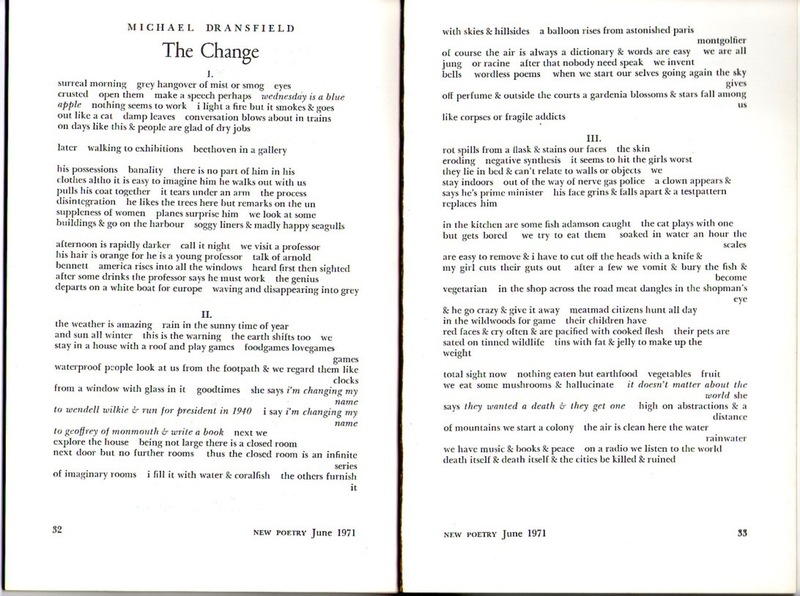 The girls liked Dransfield and Shelton -I think Les Murray spent a couple of years wandering too – before he secured is translating job in Canberra. It seems to me most of the good Australian poets of the seventies spent at least a year or two in the sort of homeless/wandering/psychosis that Dransfield unfortunately never survived – Charles Buckmaster, one of the first La Mama/Pram Factory poets, blew his head of with a shotgun and left but a few poems seeking some sort of enlightenment/ transformation/ redemption. Robert Adamson, himself lived the life of a poet without any visible means of support and hung around Nigel Roberts’ place in Balmain and Dorothy Hewitt’s house / Brett Whitely’s studio like a mad lover and formidable gatekeeper for the post Sydney push – the new avant grade of romantic surrealists with attitude. Living the life of a poet in Australia without any visible means of support, including literary grants is a matter of great interest in both Sydney and Melbourne and rural Australia – it producers a different sort of poetry than that of the social engineers and academic gatekeepers – the ‘Writing & Editing’ courses. Jazz Duke/ John Anderson/ Shelton Lea/ Eric Beach/Adrian Rawlins/ Geoffrey Eggleston/ Geoff Goodfellow/Michael Duggan/ even PIO – the balladeers – and the communities around which these free spirits lived. In the 1970’s some still believed in transformation by drugs though, in Melbourne – ‘art by drug’ died with the Pram Factory though Phil Motherwell soldiered on. 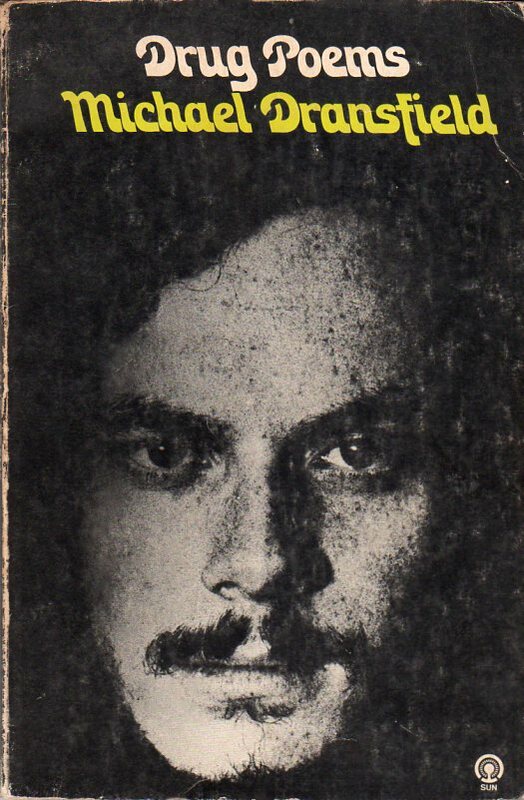 Partrick, I think you put too much emphasis on the beginning of the seventies as some kind of awakening in poetic consciousness in Australian poetry. Brennan, Gwen Harwood, Bruce Beaver, Judith Wright, Dorothy Hewitt and Francis Webb among others were doing amazingly innovative work before Dransfield, and a few of them suffered neglect and mental illness too. How do I know about this, because my lecturers at Sydney Uni. read them and taught them to me – your so called academic gate-keepers should not be stereotyped so crudely as you have done in your post. There are other gatekeepers than the academic kind – Robert Adamson is a gatekeeper though not an academic – Les Murray is a gatekeeper but not academic. Not all gatekeepers are social engineers – though many are. The point I was attempting to make though, was that there is a significant body of Australian poetry exists before and after – outside – the reach of any of the gatekeepers. 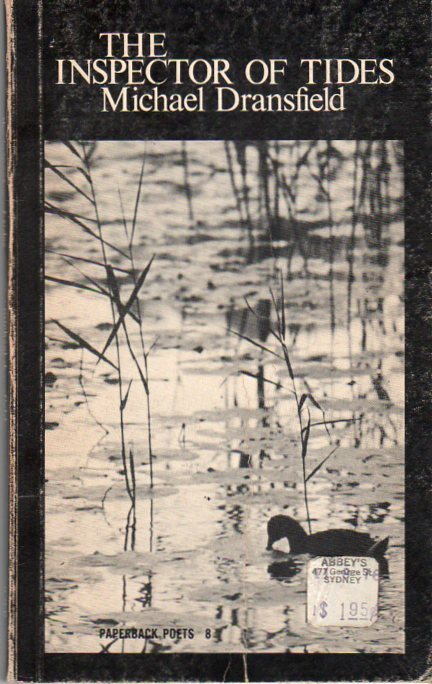 The pub poets/ the bush poets/ the reclusive poets/ the real outsiders such as Shelton Lea and John Anderson, Eric Beach, Jazz H Duke who wrote and write excellent and sometimes visionary work which never enters the academic narrative. I can’t help wondering sometimes if the best Australian poem was never published, but burned in an backyard incinerator by the poets sister after he died and was heard or read by only a handful of people. Yes I read Harwood/ Beaver/ during the sixties – but also Dawe who I believe survives right through up to the present along with Murray. Wright became politicised with the liberations – just as James McCauley did with communism/ catholicism – both of them sacrificed their poetry. I preferred Merv Lilley when it came to poetry, though it was simple, I could hear the cane cutter. Dorothy was more the writer. I didn’t mean to be crude, Adam, but I do struggle with the social engineers (Wright,Kinsella etc etc) and the genre of poem that the ‘writing and editing’ courses seem to be producing and publishing. 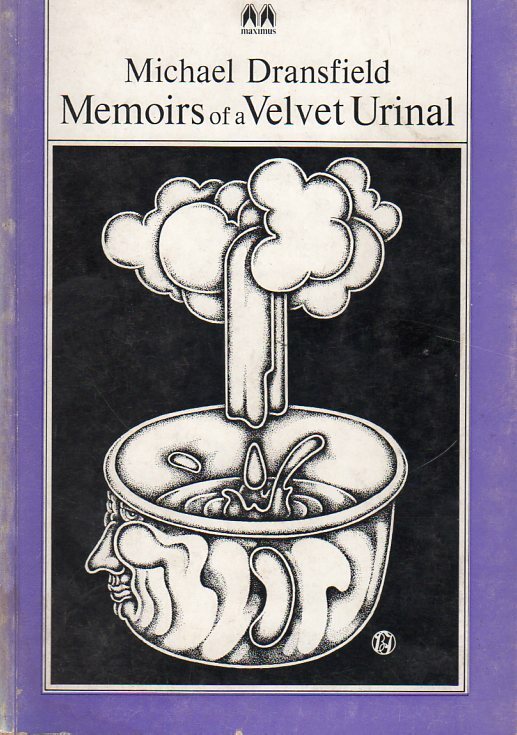 The mad free spirited/addicted/bohemian/all the way poets of the seventies were of a different quality to any of those sixties poets you mentioned – they had to go a lot further than Harwood or Beaver did. I don’t think we knew much of Francis Webb (down here in Vic) till the end of the seventies – but certainly Webb. Hewitt and Wright were the avant garde of the sixties and held in great esteem by the seventies mob. 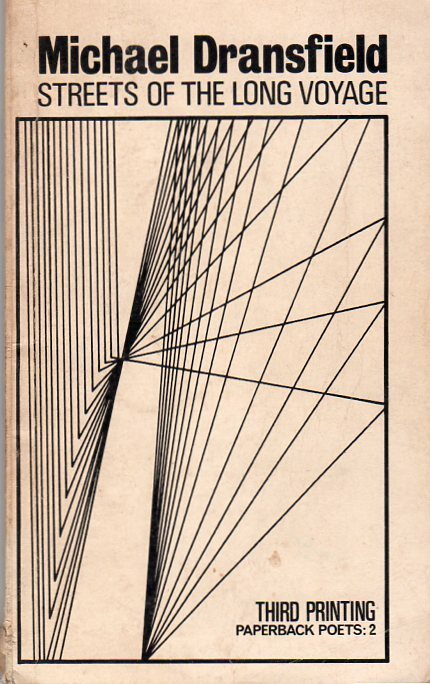 There was an awakening in prosodic consciousness during the seventies – poems started to be read and performed in pubs and clubs and dives – in plays – between the bands – on the ABC – off the backs of trucks at country festivals etc. A poet then, had not only to write poems but to read them and live the life of a poet publicly. For the first time in Australia poets became public – they could no longer exists as faceless names or pseudo names hiding around university bars. For the first time poetry acquired a face. Like Dransfield did in Sydney. He felt he had to live the life of a poet as well – the whole gestalt of it. In Melbourne that was Shelton Lea. It could be – that the authentic voice of Australian poetry was only kept sacred by those who could avoid the gatekeepers. In 1967 I asked Roland Robinson what you had to do to be let in through the Gates, he told me to keep up my guard and to learn to spell, especially the names of people, because if you got the spelling of names wrong, it showed disrespect. Check out ‘Hewitt’ ‘Whitely’ and ‘James McCauley’ against their real names. 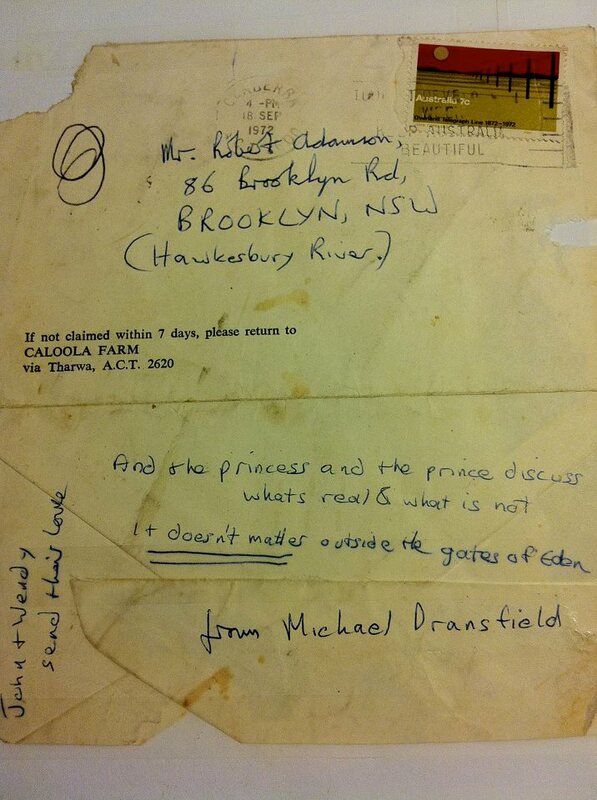 So is this why Dransfield quoted from Dylan on the envelope…..did he think he was outside the gates of eden? who was the gate-keeper? 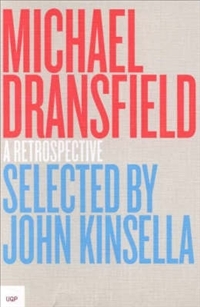 https://rochfordstreetreview.files.wordpress.com/2012/04/dransfield-envelope.jpg ….. Sorry – Hewett/ Whiteley/ McAuley (you’d think I’d remember that one) – Adam misspelled Hewett too – but if the gatekeepers only let through the best spellers – then they’re missing a lot of very good poets. We all know that good poetry has nothing to do with spelling – though I agree it is important. Of course the poets who wrote for the voice rather than the page did not have to spell their work at all. The gatekeepers of the last couple of Australian Poetry Anthologies seem to be so unashamedly Sydneycentric that one can only wonder what their cry for ‘inclusiveness’ means – and the hypocrisy of it. 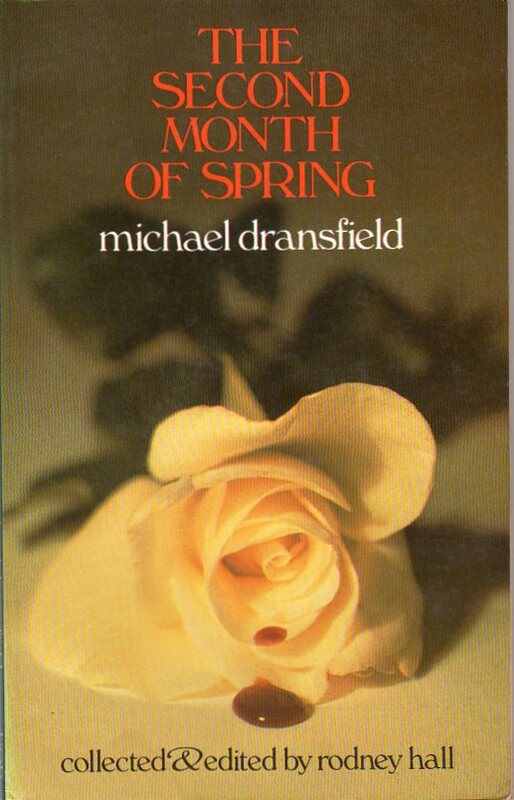 There is a significant body of Australian poetry ignored – though Dransfield seems to be the major Sydney omission. Was he omitted because of the drugs? – Australian poets seem to be often judged by the gatekeepers on morality/class/race/ gender/ sexuality etc rather than the actual poetry. There are, of course, numerous groupings of poets/writers at any point in history. In m any cases these groupings are quite fluid with poets not identifying with any one group but being associated with a number of different groups – or even non at all. In some instances poets group together due to a shared poetic belief other times their poetry might be quite different but they share a political belief, or a shared geographical position. In most cases I’m not sure if the term ‘gatekeeper’ is the correct one. Were Robert Adamson, John Tranter, Les Murray, Geoffrey Lehmann or anybody else ever a ‘gate keeper’ for a poetic ‘movement’ (interestingly enough all my suggested gate-keepers are male – what does that say about the excluded poets). One could argue that the closest they might get is as editors of magazines, anthologies or small presses – Adamason in the days of New Poetry, Tranter as an anthologist (The New Australian Poetry etc) and as editor (eg Jacket), Lehmann obviously as an anthologist and even Murray as poetry editor of Quadrant is obviously keeping the radical hordes from the bedrock of poetic conservatism. I guess I see the vibrancy of Australian poetry as a balance between all these different groupings – and I include the non mainstream along with the mainstream here (so Women writing groups, Gay and Lesbian, no Anglo writers/writers in languages other than English, performance poets, etc). If there are ‘gate keeper’ in Australian poetry I would like to think of them as isolate figures on small rocky outcrops while the swirling and diverse currents of Australian poetry threaten to wash them off. The academy must be constantly threatened and editors constantly challenged (and not just by the poetry that they read but by other editors, other publications). 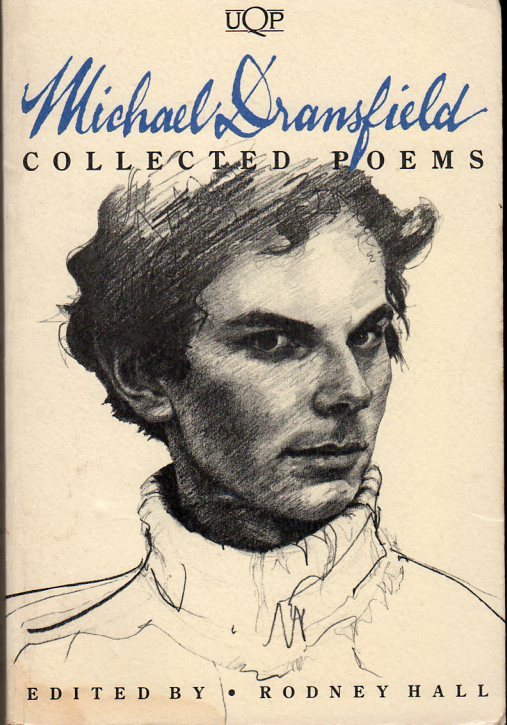 In one respect by excluding Dransfield from the house brick that is Australian Poetry Since 1788 Lehmann and Gray have actually encouraged a groundswell of support for him – so that Emily Stewart, writing in Cordite, can say “arriving just in time for Michael Farrell, who was totally on-trend with his paper about Michael Dransfield, who seems to be everywhere right now”. (http://cordite.org.au/guncotton/highlights-from-the-poetry-symposium/). Yes poets like Jas H Duke and PiO have been neglected (but even here magazines like Going Down Swinging championed their causes to a degree – in Duke’s case I seem to remember an issue of GDS containing a CD of Duke’s shortly after his death). But there are also other poets such as Vicki Viidikas, Kerry Leaves, Jennifer Rankin etc who deserve more acknowledge than they have received. I hope to highlight as many of these writers as I can in future issues of RSR – anybody who wants to help stir the pot (and bypass a few gatekeepers) are welcome to come along for the ride….. I can’t spell either, though I make sure I check the spelling in every poem I publish and in each letter and every book review that I write and I hope others may read. Simone Weil and Francis Webb and a quite few others have written that attention and attentiveness are forms of payer. Paying attention to each word in the object of the poem, the song of the poem, the poem as a machine, the poem as a process or a theory, the poem as the invisible worm that flies through the night in the howling storm, all these forms of attention, including the attention to spelling are all complexities that run in the deep undercurrents of poetry and we need to take account of them. The love of language, the awareness of what each word in the poem is doing, the lyrics of the song, and that singer and lover who ‘knows too much to argue or to judge’ all indicate how much we care about ourselves, poetry and those who love to listen and to read poetry. Good spelling has to do with manners and bad spelling is a great distraction. We often spoke in Dylan quotes, the thing about this particular quote though, was that it was sent a day after Dransfield passed through the South Coast town of Eden. Mea culpa, Robert, I do carefully check spelling in my poems and essays but have been a bit slack on my blogs/posts etc probably because it is more immediate and nobody else seems to worry – but yes I accept your criticism and of course thoroughly enjoyed your excellent post about the need to nurture and love language. It is not the gatekeepers who are on ‘rocky outcrops’ Mark – it’s a significant number of good Australian poets – but in the end that comes down to the fact that most people do not read (or buy) poetry anymore. Why – because they can’t understand it. So why bother. Also the way I saw it over the past forty years or so – it was the gatekeepers keeping the conservative hordes from the bedrock of poetic radicalism. wide. The nurses in Vic went on strike for more ‘respect’ – they wanted more money. and I survived more by poetry than manners. Manners can mask deceit. redemption – I reckon most poets write for redemption – to be released from the self – out into ‘the open fields’ (paddocks) – Blake released himself early as a spiritual being trying to be human – by the love of his woman – Whitman through his homosexuality was released/ released himself – but what about poor Ezra Pound – he was caged by the gatekeepers – yet almost certainly directed/ enabled the greatest poets and writers of his time. He himself wrote profound poetry which is still ignored by the gatekeepers. 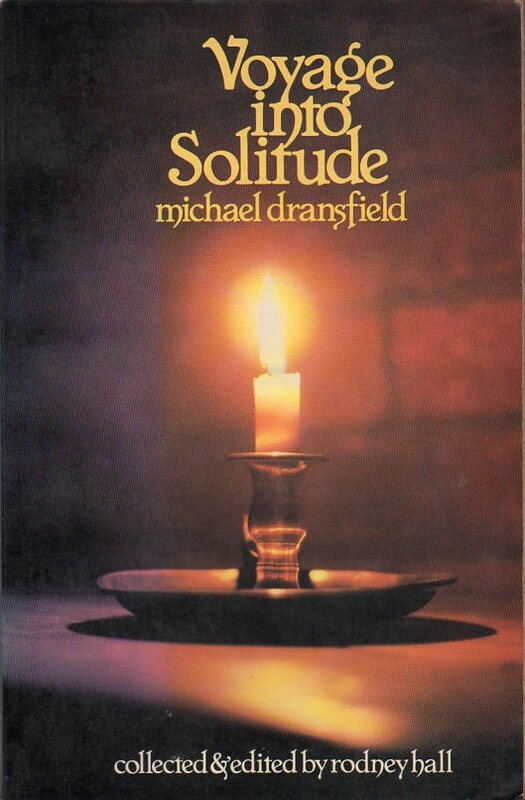 I agree that Dransfield’s poems were free, perhaps that is why they were ignored for so long, (and to some extent are still ignored) but I don’t know if I can believe that Dransfield the man was not still caged when he died. Brett Whiteley seemed caged too – yet you wouldn’t know it from the paintings or his success. I can’t see how anyone could argue that Francis Webb was not caged throughout his whole life. We are talking about whether or not a falling tree makes a noise if no-one hears it fall. Puts all of Heaven in a Rage. It’s the poetry and the painting that transcend the cage: who can tell how ‘caged’ a poet or a painter may or may not be, ‘ can birds be free from the chains of the skyways?’ (Bob Dylan) ‘Though we sang in our chains like the sea.’ Dylan Thomas; and then Rimbaud’s: ‘I’ve stretched ropes from steeple to steeple; garlands from window to window; chains from star to star, and I dance. and Bob Dylan’s ‘Another blind man at the gate’. …but surely those who freed us should themselves be freed. they will come no more, the old men with the beautiful manners, but we must keep looking, and trying to be those men, Bob. The publication of Paula Keogh’s memoir lends another dimension to the fable that was Micheal Dransfield who I remember as a gangly teenager hanging around for a free toke. I find the ping back very readable. So, here we are in 2017 … five years after this post was first placed .. and I note the Editor of RSR denies there are ‘Gatekeepers’ … Yet only last week he refused to publish my review of ‘The Herring Lass’ by Michele Cahill … because …. ‘Michele has read the review and does not want it to be published’. This is how you become a ‘ Gatekeeper’ Mark. So are all RSR’s Okayed by the poets first ? … how can I ever read a RSR again without suspecting that it is merely another advertisement ?